This is based on a series of books and a comic strip by Swedish-Finn illustrator and writer Tove Jansson, originally published in Swedish. They are a family of trolls who are white and roundish, with large snouts that make them resemble hippopotamuses. The carefree and adventurous family live in their house in Moominvalley, in the forests of Finland, though in the past their temporary residences have included a lighthouse and a theatre. They have many adventures along with their various friends. At the end of the world, on the top of a tall mountain, lives the Hobgoblin. It is said that he can transform himself into anything and that he flies through space on the back of a black panther. He collects rubies which he takes with him in his robe, and his collection is the finest of them all. Recently, flying off from the Moominvalley with his most precious ruby, the Hobgoblin had an unfortunate collision with a comet. His ruby was scattered into numerous bits which sprinkled over the valley. This made the Hobgoblin a very sad wizard. What he doesn't know is that Moomintroll's friends have found all the bits and kept them safe. 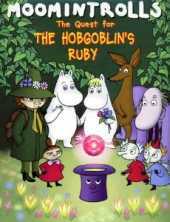 Come with us to the Moominvalley and let's look for the nine bits of ruby. Maybe we can put the ruby back together and make the Hobgoblin happy again.